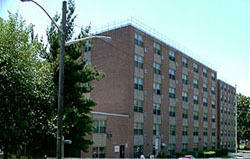 Englewood Housing was founded in 1976. The first building to be constructed was the Vincente K. Tibbs Senior Citizen building at 111 West Street in 1976 consisting of 152 units of efficiency and one bedroom units. In 1981 Westmoor Gardens, a section 8 Multi-Family Housing Complex, was constructed for 64 families. In 1991, the Housing Authority acquired 167-169 Morse Place, a four family structure with four units. In 2001, the Housing Authority purchased 115 Humphrey Street consisting of 9 units primarily for Section 8 qualified senior/disabled individuals. Funding to maintain these properties comes primarily from the federal government directed at low and low-to moderate income families. Housing Authority policies and procedures including, but not limited to, Admissions and Occupancy, Grievance Procedures, Section 8 Administrative Plan, Procurement Policy and Rules and Regulations are available for public review at 111 West Street, Englewood, NJ 07631. To request copies of Housing Authority documents, and in compliance with the Open Public Records Act (OPRA), please complete the required form. Copyright © 2015 Englewood Housing Authority.